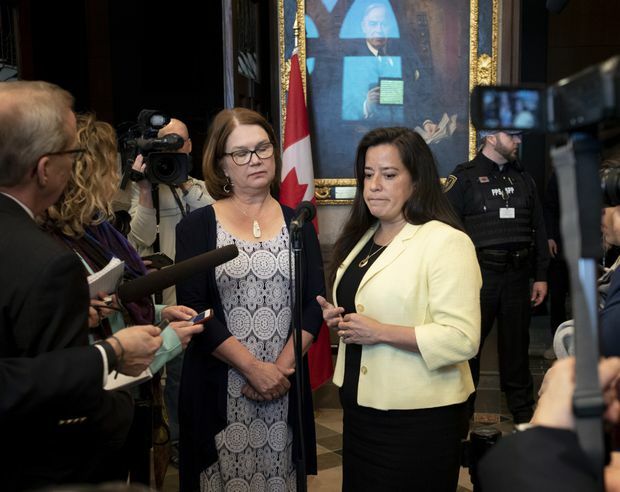 Former Liberal cabinet ministers Jane Philpott, left, and Jody Wilson-Raybould speak to reporters before Question Period on Parliament Hill in Ottawa, a day after being removed from the Liberal caucus, on April 3, 2019. Former Treasury Board president Jane Philpott says Prime Minister Justin Trudeau expelled her and Jody Wilson-Raybould using a unilateral process that violated federal law. She said she believes the Parliament of Canada Act has been breached. That is because the Liberal caucus neglected to conduct recorded votes in 2015 when Parliament resumed after the federal election on whether to adopt new rules that were intended to give rank-and-file MPs more power. The requirement to vote on whether to use those rules is laid out in law. In 2015, a private member’s bill brought forward by Conservative MP Michael Chong was passed that amended the Parliament of Canada Act. It included the new rules that would give MPs more power in determining important decisions such as expelling MPs from caucus or readmitting them. Mr. Chong’s rules say 20 per cent of a caucus must submit written notice to review an MP’s membership in the caucus, and that they can be ejected only if a majority of all caucus members vote to do so in a secret ballot. Ms. Philpott says nothing of the sort happened before she and Ms. Wilson-Raybould were kicked out of the Liberal caucus. Mr. Trudeau declared to journalists on April 2: “I have taken the decision to expel the honourable members” from caucus. The legislative changes enacted through Mr. Chong’s private members bill in 2015 require caucuses to meet after a federal election and take recorded votes on whether to adopt the new rules. Liberal MP John McKay said “there was no vote” when the Liberal caucus met after the 2015 election to decide how to proceed with the rules Mr. Chong had set out. He said it was a consensus decision. The Prime Minister’s Office declined to provide comment on Ms. Philpott’s request to the Speaker, and referred questions to Liberal caucus chair Francis Scarpaleggia. “The decision about membership in caucus remains the Prime Minister’s prerogative,” he said. “By implication, the Liberal caucus did not opt in to the … [Chong] suggestions for how to conduct internal caucus business,” Mr. Scarpaleggia said. Later on Tuesday, the Liberal government disputed Ms. Philpott’s allegation that the Parliament of Canada Act was broken. Under parliamentary procedures, the Speaker must rule on Ms. Philpott’s request. Rob Walsh, a former law clerk with the House of Commons, said the Speaker doesn’t have power to interpret statutes, and has no jurisdiction to intercede with regard to the internal affairs of a caucus. “It’s an internal matter to the caucus and the rules of the House do not give the Speaker any jurisdiction with regard to the business of caucus,” Mr. Walsh said. Ms. Philpott said the rules for caucus expulsions would have required at least 90 Liberal MPs to vote by secret ballot in favour of ejecting her and Ms. Wilson-Raybould. “Members of Parliament are not accountable to the leader; the leader is accountable to members of Parliament. This is a constitutional convention. I cannot adequately underscore how important this part of the confidence convention is,” Ms. Philpott said. NDP MP Brian Masse said while caucus meetings are confidential, the caucus “fulfilled the requirements of the [Chong] act” and the results were sent to the Commons Speaker.